At our clinic, we can help you learn effective tools to manage stress levels in all areas of your life. Whether this is with work, school, relationships, loss, or change our counselors are here to help! Have no Fear! Chicago Counseling Center is here! Almost every aspect of our lives can create stress, and at times it can feel unmanageable. Fortunately, there are proven, effective therapeutic methods people can learn to better manage and let go of stress in their lives. This true regardless of the source of your stress. Contact us to learn more about how the counselors at Chicago Counseling Center can assist you in understanding how stress impacts your life! You wouldn’t be human if you didn’t experience at least some anxiety and stress from time to time. When your stress starts to disrupt your daily functioning, that is when you must seek support. It may only take a few sessions to get back on track. Do you find yourself dreading work on Sunday nights? Avoiding social gatherings more than usual? Unable to talk to your friends and family about what is concerning you? 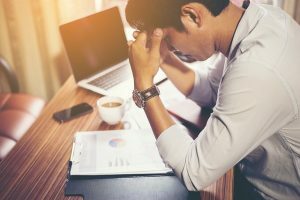 If you answered yes to any of these questions, please give us a call as soon as possible and we can help you learn to manage your stress level!